Striking a pose with ultra-mod style and distinctive European flair, this designer sofa in gray is beauty without compromise. Rest assured, the sofa's seating area is wrapped in real leather for your pleasure. 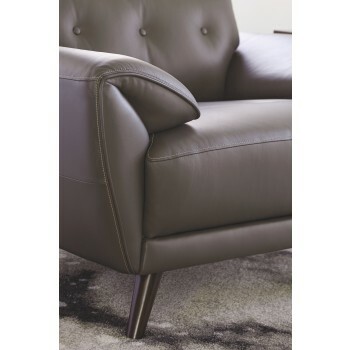 The highly structural profile is enhanced with channel stitching, button tufting and wraparound pillow top armrests for a richly tailored aesthetic that’s cool from every angle.